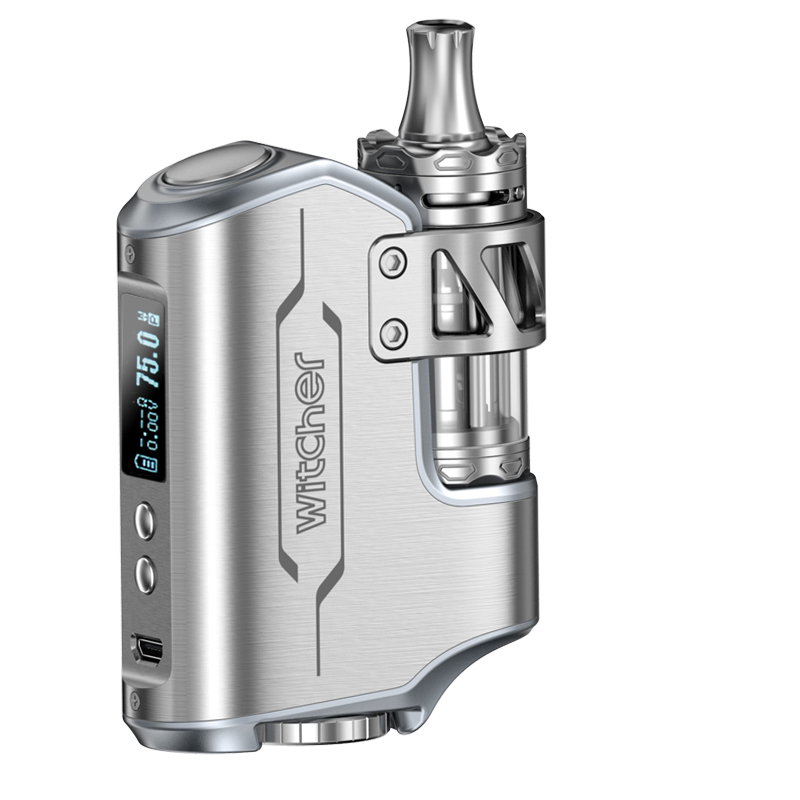 Successfully Added Witcher 75W Mod Vaping Kit - 3 Coils, 98% Efficency, VT Ni / VT Ti / VT SS Power Modes, Rebuildable Atomizer (Silver) to your Shopping Cart. 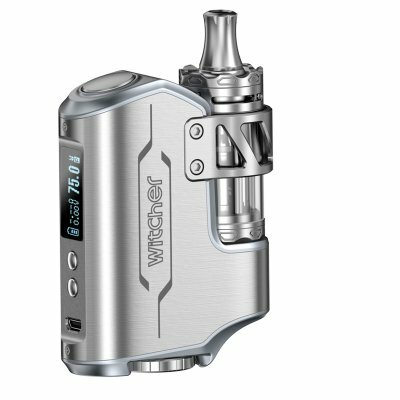 This beautifully proportioned mod kit from Rofvape is the Withcer 75W box mod and is styled to fit in comfortably in your palm for easy use. Combining a Witcher tank and Rebuildable Atomizer with 510 connection threading you can customize the setup for your own needs. There are 3 coils in this mod kit so you can choose between a 0.3 ohm SS, 0.2 ohm Ni200 or a 0.5 ohm kanthal coil and with a plug fitting they are quick and easy to interchange. A 7 to 75 Watt range and power modes for VT-Ni/VT-Ti and VT-SS lets you regulate the temperature to the optimum setup for the nickel, titanium and stainless steel coils. Now you can create huge vapor clouds or vape discreetly as you please all at the touch of a button. The Atomizer has a "Roman Column" structure to promote better airflow and the connection uses a gold plated spring loaded centre pin helping the mod reaches an impressive 98% efficiency. With a 5.5ml capacity and powered from a removable 18650 battery that's rechargeable via a mini USB charging port the Witcher mod kit can keep you going for days and won't let you down. On the side of this vape made is a 0.69 inch screen displaying all the vital info such as temperature setting, power mode and level battery charge indicator and more. the highly advanced vape mod has protections for overheating, short circuit, low battery and incorrect atomizer connections so you can rest assured in the quality and safety of this vaping kit. Whether you're looking for an alternative to cigarettes or want a mod that can be expanded on the Witcher 75W box mod from Rofvape is the perfect fit and comes with 12 months warranty, brought to you by the leader in electronic devices as well as wholesale vaping kits, mods and atomizers.. I've been using this unit for a couple of weeks and really like it, its solid, seems well built, comes with a range of coils and certainly has the power to create peasouper fogs of vapour. I am currently using it turned down to 25, the 75 was way too much. I have only had to charge it twice in two weeks which is pretty good too. Basically love the weight solidity and excellent vaping capability. No battery in the box. you have to buy the battery locally but the first vaping shop I went into had them in stock. Still cost me an extra £10 for the battery but still worth it as I have spent a lot more money on a lot less enjoyable vaping gear.